Why should I have spine surgery in the United States? Spine Surgery in Canada vs. Spine Surgery in the U.S.
Canadians enjoy a great healthcare system. But sometimes the wait can be long for specialized surgical procedures that can get the person back to their life. According to a 2016 report by the Commonwealth Fund, 29% of adults waited two months or longer, compared to 6% for the those in the United States. In Canada 18% of adults had to wait longer than 4 months for non-emergency surgery, compared to 7% in the U.S. Another report by the Fraser Institute in 2014 showed that 52,513 Canadians traveled to the United States for elective surgeries rather than wait 6 months or longer for surgery in Canada. The report also documented that the number of Canadians accessing healthcare in the U.S. was growing rapidly at 25% increase each year. Unlike in the United States, appointments with specialists in Canada are determined by the government’s assigned “priority and need,” rather than the patient’s desire, and willingness to pay, for a knee replacement or back surgery to get back to work or their favorite sport. When is a herniated disc an emergency? Such is the case with back and neck pain. Unlike other medical issues where pain is a good indicator of an emergency or urgent need for care, with back and neck problems pain is not necessariy a good indicator of an emergency symptom. Yes a back spasm can be excruciating and knock a person down to their knees. But a back spasm does not require surgery. What happens if I wait for my spine surgery? Instead, for back and neck problems, the emergency symptoms are weakness or numbness in a hand or foot, or loss of bowel/bladder control — something many people don’t associate with a herniated disc in the back or neck or any kind of spine injury. But if these symptoms are not treated within 24 or 48 hours, the pressure of the herniated disc on the nerve root can cause permanent paralysis. This makes the numbness/weakness, or incontinence, permanent and lifelong. Click here to view our Symptoms Chart. Another somewhat urgent symptom for back pain and neck pain is “radicular pain” where the person feels searing pain radiating down into their leg from a herniated disc in the low back, or radiating pain into an arm from a herniated disc in the neck. While watchful waiting, or spinal injections, can be used for radicular pain, if the radiating pain symptom is not relieved over three months or so, some research studies show any subsequent surgery may not be effective in relieving the radiating pain. In this sense, extended pressure on the nerve root causes a permanent crimp in the nerve, causing it to remain in a “stuck” position and constantly transmitting a pain signal to the brain. The best analogy is to picture a car sitting on a garden hose on the driveway. If the car sits there for a month before moving, it can leave a permanent crimp in the hose. The nerve works the same way. The longer the nerve is compressed by a herniated disc, the less likely it can return to normal function. Conseqeuntly, when a person has a herniated disc in the low back or neck, being a “patient” patient can result in lifelong disability. So while a Canadian may well choose to endure the pain and discomfort associated with a one-year diagnosis and treatment cycle an arthritic knee joint and eventual artificial knee joint replacement, their is very real risk in delaying treatment of a herniated disc. Is spine surgery better in the United States? Beyond the medical urgency related to treatment of a herniated disc, the second reason thousands of Canadians from Vancouver and Calgary to Montreal and Quebec City choose to have back surgery or neck surgery in the USA relates to access to the best and most advanced spine surgeons and spine technology. While the traditional treatment for many herniated discs is spinal fusion, this locks the vertebrae together. Recent research from the North American Spine Society now has shown that when you lock two vertebrae you cause “adjacent segment degeneration.” This means by locking two vertebrae together, the fusion then puts more pressure on the discs above and below the fusion site, causing these other discs to then herniate as well. With spine surgery in the United States, the best spine surgeons can perform artificial disc replacement surgery. By inserting an advanced artificial disc in between the vertebrae the best spine surgeons are able preserve the natural motion of the spinal joint. The other issue is that the best spine surgeons in the United States now perform minimally invasive spine surgery through instruments the width of a ball point pen. Instead of a three-inch long incision, these highly trained spine surgeons operate through an inch-long incision. There is significant training, however, required to use minimally invasive instruments like tubular retractors. Many older surgeons, conversely, prefer to make a three-inch incision because it’s easier for them, and that’s how they’ve been trained, and they aren’t comfortable learning a new way or looking through a cannula to visualze the disc on a TV screen. The benefit of a tiny incision is huge to the patient, however. There is less blood loss and no need for outside blood. The minimally invasive spine surgery patient also can go home hours later, on the same day, to recover in their own home. Because the incision is shorter, there is less disruption to muscles and ligaments so the recovery is quicker and much less painful. Navigating the world of artificial discs, tubular retractors, laser spine surgery and Mazor robotics for surgical navigation can be daunting for those exploring spine surgery in the United States. We understand this and all the questions a person may have related to medical tourism and the travel to U.S. spine center for spine surgery. You can learn more about the training of our spine surgeon by clicking here. You can also click here to watch videos of our other patients who have had spine surgery at San Jose Neurospine and are now pain free and back to their favorite sport or recreational activity. The educational Internet site at SanJoseNeurospine.com can answer many of your questions about nonsurgical treatment options for spine surgery, the benefit of an MRI review in advance of your travel to the United States, and if you should have spine surgery in the United States. You can also find helpful home remedies for back and neck pain that can get back to activity this year. Should I have spine surgery in the United States? San Jose Neurospine is a particularly convenient U.S. resource for a second opinion for spine surgery for those in the Calgary, Canada area. There are connecting flights from Calgary International Airport to San Francisco and San Jose airports. Calgary patients coming to the U.S. for spine surgery can access minimally invasive spine surgery and artificial disc replacement treatment options for a herniated disc that otherwise aren’t available in Calgary or Canada. If back or neck pain, and herniated disc symptoms, are limiting your activity, you don’t have to wait for spine surgery. If you’ve also wondered about laser spine surgery, please visit our educational page at on Laser Spine Surgery in the United States. San Jose Neurospine is about 45 minutes from San Francisco International Airport (SFX), and only 14 minutes from San Jose International Airport (SJC). We are about 1 hour from Oakland International Airport (OAK). These major airports provide access to many major Canadian cities including Calgary, Edmonton, Vancouver, Medicine Hat and other locations across the provinces of Alberta and British Columbia. 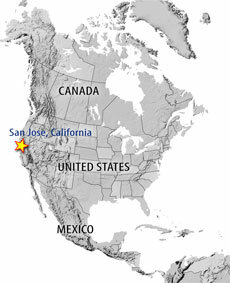 San Jose is part of the Silicon Valley, just south of San Francisco. We can provide recommendations on the best hotels and tourist attractions in the area. On the form below, you can email us any questions you may have about your back or neck problem, any previous diagnosis you have, the costs of spine surgery at our spine center, travel to our center, the treatment process, and where we perform our surgeries. San Jose Neurospine includes the expertise of Dr. Onibokun, a Board-Certified Neurosurgeon who specializes in complex spine surgery and neurosurgery. He is proficient in minimally invasive surgical techniques that use smaller incisions and allow for faster return to work and activities. If you have back or neck pain, please contact us today to request a consultation.